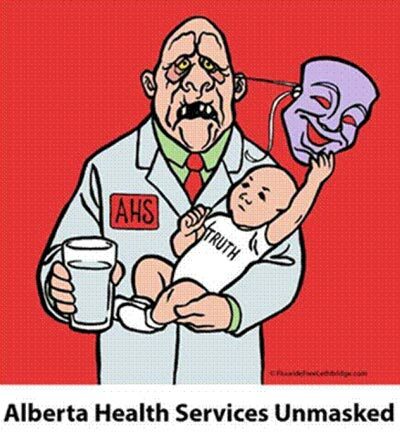 In May 2013, Alberta Health Services (AHS) responded to the growing opposition to artificial water fluoridation by issuing an internal memo to its frontline staff on how to answer the public’s objections. This memo was leaked to Fluoride Free Lethbridge, which has responded, rebutting the fundamental errors and deception of the AHS position. In contrast to North America’s policy of artificially fluoridating municipal water, most of the world, including 98% of Western Europe, Japan, Russia, and China has rejected the pseudoscience defending water fluoridation. Israel has recently decided to ban it nationally. In the last three years alone, 30 communities in Canada have discontinued fluoridation. We are sending you this rebuttal because all health authorities promoting fluoridation use the same outrageous arguments to defend this egregious practice of poisoning municipal drinking water.